Our approach to personal goal setting and for the user to achieve their goals are based on the well-known theory called Total Quality Management (TQM). This is an old strategic management philosophy that is best known for the Japanese industry. The modern philosophy was brought to Japan after the Second World War and became a foundation for the rebuilding of their country. Toyota is the world leading company utilizing the philosophy of TQM. Lean strategy, which is a new and popular phrase rise from a concept Toyota implemented in the late 60’s or early 70’s. They called it Muda Kaizen. Muda (waste) Kaizen (continuous improvement) can be explained to be the removal of all parts that are not relevant to the process. By using total quality management techniques we created a system for achieving goals. This system became the jumping-off point for Personal Quality Management, known as PQM. The biggest hurdle for change is how easy it is to fall back into old habits, and give up, before any lasting results are achieved and NoLimit is designed to motivate the user by statistical feedback. This feedback keeps the user focused and on track. One of my friends was working in an office and not really happy “pushing paper” all day long, identifying that working with people rather than paper created a new career goal. The ‘now’ situation identified lack of academic credits to commence this type of work, which resulted in a two-year path starting to save money and complete the necessary degree to get the right job. He did it the NoLimit way! TQM has been well known as a business strategy for several decades, and many organizations work by the principles of this philosophy. 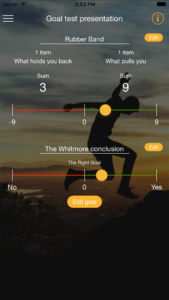 With the NoLimit-app – goal setting app we have made a system that utilizes the same philosophy but on an individual level. There are several tools in TQM philosophy that are not adaptable for individual use, but there are also many tools that enable the individual to get a strong and clear picture of their situation and what they should do to improve their situation. This is all of what Personal Quality Management (PQM) is about, relevant elements from TQM for individual use. 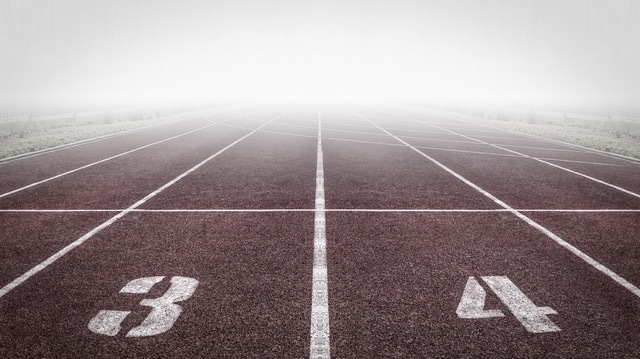 TQM for businesses have an initial basic principle: Identify what you want to accomplish (define a goal), find your current status (where are you now), what lies between your current standing and your goal is your path. For organizations, this is defined in their strategy. 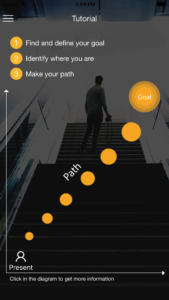 The path is where the operational tasks, necessary to complete in order to reach the defined goal, this can be new tasks or improvements in existing tasks. These are the same basic principles for individuals. The fundamental concept of TQM can be explained with this simple figure, and it can just as well be used for individuals. The Personal Quality Management roadmap is a more detailed approach to the “Goal, Present, and Path” model, it explains the steps in details. “Why” relates to your goals and provide reasons to reach them, your motivation to put an effort to it. “When” relates to how fast you can accomplish your goals based on your current state and what is missing. 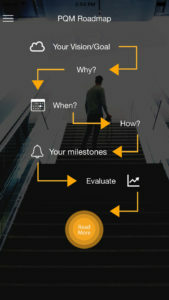 “How” is the path with “Milestones” and “Evaluate” is to check if you are on track. We provide the user with several elements from TQM philosophy amended to suit individual purposes, including tools that identify the current state with potential challenges. 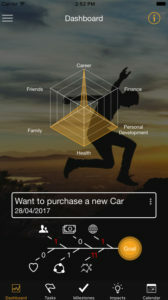 Self-assessment which the user can conduct whenever a development has been made. A dashboard overview from where the users have easy access to tasks, milestones, and impacts. This is a dynamic screen that updates continuously. Tools to support personal development! To further support the user we develop a series of tools that will be applied to the app. Tools range from identification to actually help in the improvement process. TQM app uses a lot of statistical tools to provide a good picture of the situation at hand for businesses and this is a challenge for PQM. Statistic equations require quite a lot of data to be accurate and this can be difficult on an individual level where collecting the necessary data will take so much time that the time frame for valid data collection is exceeded. There are however some statistical tools that provide the user with valuable feedback, such as Pareto charts for prioritizing tasks and correlations of relevant factors. In business strategy we use project management tools, for individuals a daily planner accomplish much of the same. 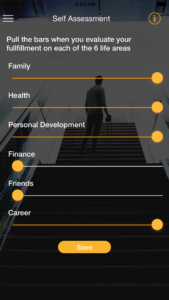 The app and the tools we provide are supporting elements so that the actual situation becomes clearer and makes it possible to make the right decisions according to what is important to the person.